Practice Area: Driving range, combined putting/chipping green. Range memberships available. 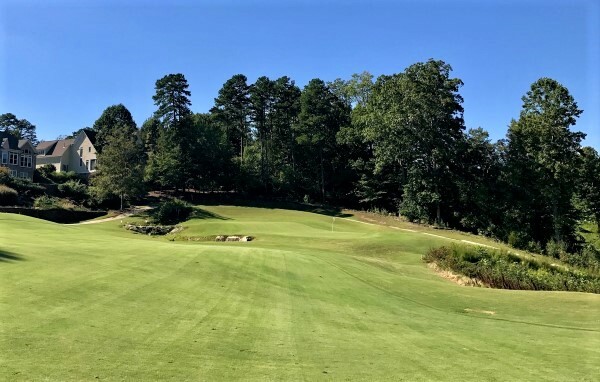 Description: Straight from their web site: "Verdict Ridge was designed in the tradition of famous North Carolina golf courses, maintaining the natural layout of the land. But what truly makes Verdict Ridge interesting is that our golf course feel is similar to a cross-state drive through NC. You can actually see different areas of the state represented as your round progresses. The first few holes give the feel of Pinehurst as the area pine trees outline each hole. As you continue to the low-lying areas of the property, you find holes that meander along creeks, streams and natural wetlands, giving a North Carolina coastal feel. Finally, you come to the final four holes that have dramatic elevation changes and spectacular views." Notes: Verdict Ridge has a large, luxurious clubhouse that would put some private clubs to shame. It includes a popular restaurant called Guilties that has live music and events on the weekends. B-Man's Take: I finally got up to play this in May 2012. It is indeed quite a haul from Charlotte, up Hwy 16. From my home in Indian Trail, it's a good 50 miles. If it weren't for the drive and the priciness, I'm sure I'd play here frequently. It is a very unique course with several gorgeous holes. You will find it plays almost like a mountain course, with steep hills and valleys. You're likely to have some sidehill and uneven lies throughout your round. My favorite hole is the 347yd par 4 9th hole -- one of the most beautiful in all of Charlotte. With water all along the right side, it's best to play an iron from the tee off the left slope. Then you have short iron approach into a green guarded by a small creek on the left and the pond on the right -- with a waterfall behind the green offering a nice backdrop. There are several difficult holes that may require a veteran of the course to give you some tips -- the long 461yd par 4 4th hole and the difficult par 5 18th hole with several hazards to navigate. Overall, this is a fun course to play due to the variety and beauty of the holes. I'll be back.